Burniture on fire. Photo courtesy of the artist. On Tuesday, November 22, 2011 a chair was born in the most unlikely of places, Sweet Water Organics. Sweet Water Organics is an urban acquaponic farm located in the Bayview neighborhood of Milwaukee. If you haven’t already been, you should make it a point to visit. The space is amazing. It’s a big open warehouse with rows of fish tanks. There are beds of lettuce and other vegetables growing above the water tanks, being fed by the tanks below. In Sweet Water’s sustainable system, the plants act as a water filter for the fish and the fish waste acts as natural fertilizer for the plants. The Sweet Water Foundation uses a wide-open space in the building as an area for performances, artist collaborations, and educational programming. Their mission is to develop inter-generational and interdisciplinary educational programming for sustainability with a focus on the potential of urban agriculture and aquaculture in the 21st century setting. Conversations between Jesse Blom of Sweet Water Foundation and Michael Carriere of the Milwaukee School of Engineering led to the idea of having artist Hongtao Zhou create a wax chair at the urban farm. Hongtao Zhou is a Madison-based artist born and raised near Harbin, China. You may remember his chairs made out of wood scraps in the Museum’s 2009 Green Furniture exhibition. He also created furniture made out of snow and ice outside the Milwaukee Art Museum in January of 2010. Hongtao received a PhD in Furniture Design and Manufacturing from Purdue University in 2008. This knowledge allowed him to calculate how long it would take for a chair to break, a skill that was of interest to big furniture manufacturers. 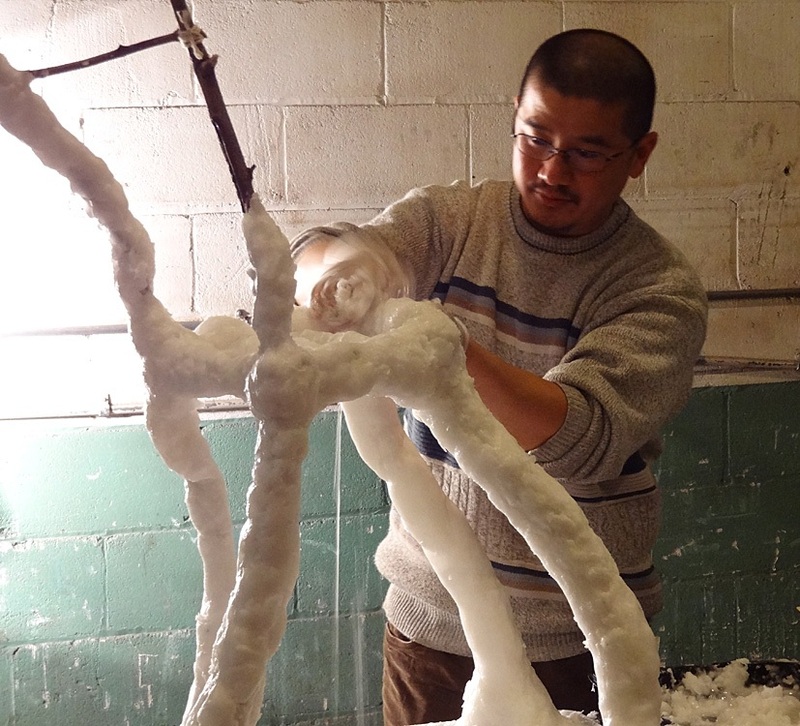 Hongtao soon realized, though, that he was meant to be an artist, and enrolled in the University of Wisconsin-Madison’s Sculpture and Furniture Design MFA program. Since then, he has created multiple sustainable forms that tread the line between furniture and art, as his Burniture exemplifies. Burniture is one of a series of works that will be displayed in the Milwaukee Art Museum’s exhibition The Tool at Hand. For this exhibition Chipstone curator Ethan Lasser asked sixteen established artists to create a work of art using only one tool. The tool, the medium, and the directions’ interpretation were left up to the artists. Hongtao Zhou melting wax and preparing wax slush in preparation for "Burniture". Photo by Jeff Redmon. Zhou was one of the artists asked to participate in this challenge. Zhou quickly and excitedly accepted, and his work quickly turned into the aforementioned performance at Sweet Water Organics. Zhou set up a double boiler, a tub full of recycled wax, and a frame made out of found twigs on an old conveyer belt at the urban farm. A crowd watched as Hongtao, and participating audience members, melted wax and molded it around the fragile frame. Once the chair was complete, Zhou lit it on fire in a beautiful coda. What follows is a short interview with the artist. Hongtao Zhou applying and molding wax on the chair. Photo by Jeff Redmon. Claudia Mooney: Where did you get the idea to make chairs out of wax? Hongtao Zhou: The idea was from rebuilding my winter piece in normal season: I missed winter and snow so much in the summer. One day I had dinner with some friends. The candle on the table sparked this idea. The dipping hot wax seemed like water or tears, which also reminded me my last snow sculpture Leaking Glacier in Quebec City. Human is consuming the ice cover of the earth. 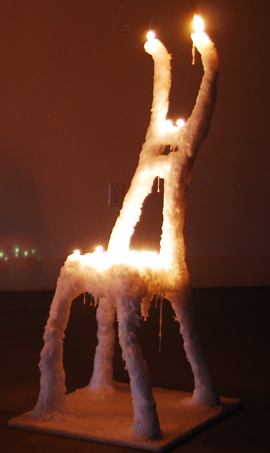 In the furniture piece, the wax is ice, it is also energy. CM: Have you made these before? HZ: I made this piece in the summer of 2010. CM: Can you describe the making process? HZ: The making process is very much like making snow chairs in the winter, the difference is that the water is now liquid wax, the snow is now wax chips. The basic process is to mix the hot liquid wax with wax chips so that they become wax slush, then you can shape it as clay. 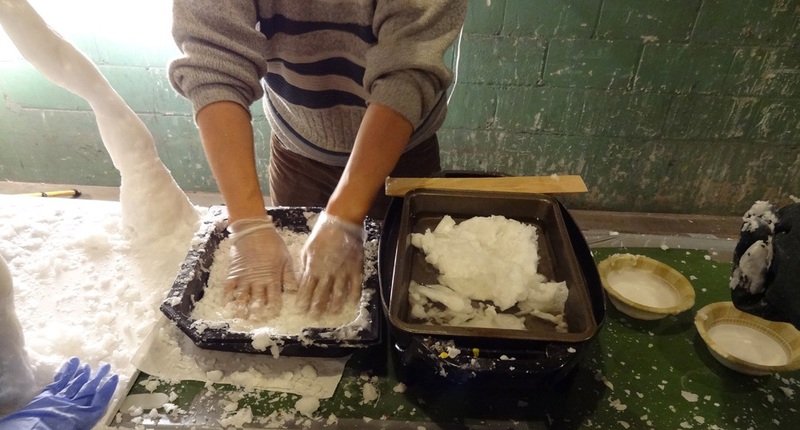 It takes a while to cool down and become solid structure, after this, more wax slush can be constructed on the top of it to continue the process. For a large structure like the chair, it would be easier to have a small armature inside. In this piece I put some small tree branches together taking their natural forms to generate an organic shape. CM: What would you say is your one tool? HZ: In the beginning, I think the hotpot. Now I do think my major tools are my hands, you can still see the trace of them in the surface of the chair. Always wear gloves please! (Protect your “tool” from heat in the wax chair or from the cold in the snow chairs). 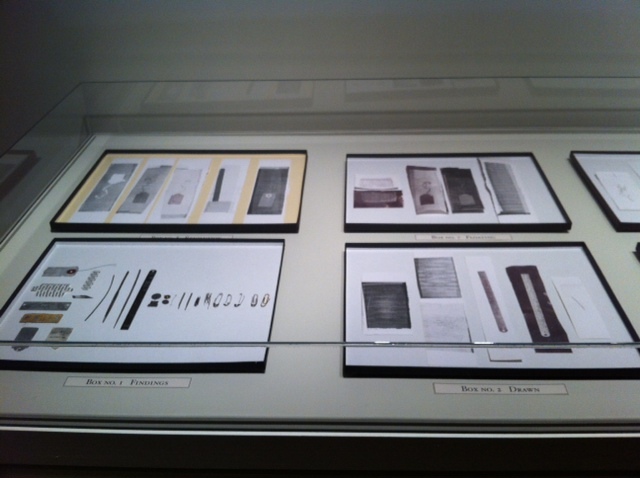 The Tool at Hand will be on view in the Museum’s Decorative Arts Gallery from December 8, 2011 through April 1, 2012. Be sure to stop by and see Burniture, as well as the fifteen other innovative artworks, for yourself! This entry was posted in Art, Curatorial, Exhibitions and tagged 20th century art, Chipstone Foundation, Design, Furniture, Hongtao Zhou, Milwaukee, Sweetwater Organics, The Tool at Hand. Bookmark the permalink. It would be super generous of the museum to post photos from the exhibit on the site. The WSJ had a picture of Dowel Bowl and that was it. If you go to the site of the Metropolitan Museum of Art for example, you can see a fair selection from the Renaissance Portrait show, a fairly new exhibit. It is ridiculous since someone there has a digital camera and if you want to protect the real estate of your site, post them on Flicker or some such site. That’s a great suggestion! We will upload some photographs in the next few days. I will post the link to the image site here and on the Chipstone Foundation Facebook page. We also have all of the artist videos up on http://www.artbabble.org/series/tool-at-hand . I hope you’ve had a chance to view the exhibit and enjoyed it. Woooowwww!!! What a great to build a wax chair, I always liked Hongtao Zhou pieces. But this is real art. My favorite projects are: the Bench made of 1000 belts, Ice & Snow Furniture Raised From Lake Mendota and CNC Adjustable Rocking Chair. This artist rocks. Wow, I didn’t know it. Thank’s for share it.